Can conference organizers get evaluative feedback on the long-term outcomes of their events? Last week, I pointed out that short-term evaluations routinely solicited at events are unreliable. 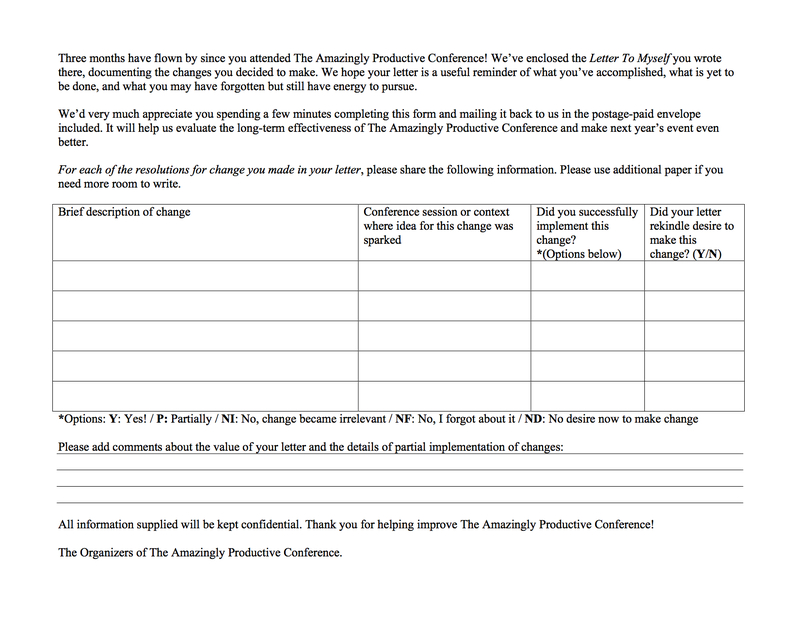 If we want to honestly learn whether our conferences create long-lasting change, we need evaluation methods that can be applied after an appropriate length of time (three months? six months? a year?—you choose!) rather than within a few hours or days of the meeting taking place. Here’s one way I’ve devised to obtain long-term feedback. It’s based on an old technique “A Letter To Myself” (ALTM, aka “A Letter To My Future Self”) which you may have experienced at meetings over the years. I call it The Reminder. In the standard ALTM version, described in Conferences That Work: Creating Events That People Love, the organizers set aside around 30 minutes just before the end of the event, supply each participant with notepaper and an envelope, and ask them to reflect on the changes they would like to make in their lives as a result of the event over the next [3 months/6 months/year/appropriate time period]. People then write letters to themselves about their changes and insert the letters into the supplied envelopes, which they then seal and address to themselves. The envelopes are collected and mailed out, unread, by the conference organizers once the announced time period has passed. ALTM works because the recipients find value in being reminded of their resolutions after time has passed. They can note what they have accomplished, what is yet to be done, and what they may have forgotten but still have energy to pursue. When I run a Personal Introspective at the end of a peer conference, I often add the ALTM exercise to provide a personal “tickler” reminder of the changes participants decide to make. A stamped envelope addressed to the conference organizers. A feedback form based on the sample below (link to high resolution version). Before the end of the ALTM session, briefly go through the feedback form with the group. Explain that completing the form on receipt and promptly mailing it back will provide the conference organizers valuable information about the long-term effectiveness of the conference, and this will help make the event even better next time. It’s harder to implement long-term evaluations of our events because participants have less motivation to provide the information we need. The Reminder combines the effect of receiving the participant-created letter with a quick request for feedback. Motivation can be increased by adding an incentive for returning the feedback form, like a small prize or chance to win a raffle from those who return the form. In this case, name/contact information should be added to the form. What do you think? Can The Reminder be a useful tool for evaluating your events? If you use it, share how it worked in the comments below. This entry was posted on Monday, November 9th, 2015 at 7:24 am	and is filed under Event design. You can follow any responses to this entry through the RSS 2.0 feed.You can leave a response, or trackback from your own site.